It happens to everybody; you’ve had a good dinner, but now it’s getting later and the hunger’s hitting. But isn’t eating at night after dinner the fastest route to weight gain? 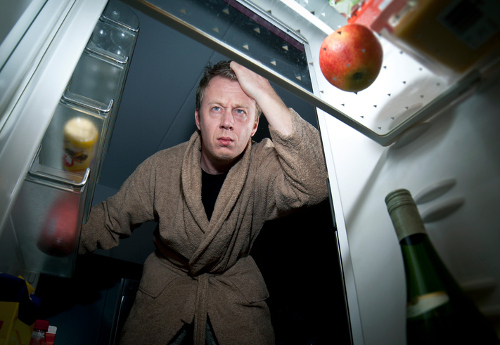 First, let’s dispel a big myth about eating at night. Consuming food after 8:00 p.m. doesn’t necessarily mean you will gain weight. Whether you’re eating a bowl of ice cream at 2:00 p.m. or 10:00 p.m., the calories, as well as macro- and micronutrient profiles, are identical. When it comes to physical changes as a result of eating at night, it comes down to what you’re consuming and how much. If your evening calories fit into the plan for your daily intake, your weight won’t change. But, if that still doesn’t convince you that eating at night is not inherently bad, there are some foods you can enjoy without feeling guilty. Popcorn is a nice, light snack that’s filling and low in calories, making it the perfect treat while spending an evening watching movies or Netflix. And, if you pop it the right way, it becomes an innocent guilty pleasure. Air-popped popcorn without butter, oil, margarine, or “butter-flavored topping” comes in at only 30 calories per cup. So, even if you eat four cups, you’re only consuming 120 calories. Furthermore, popcorn is a whole grain, and a four-cup serving offers five grams of fiber. Popcorn is also high in polyphenols, which are antioxidants that are linked to reductions in heart disease and certain cancers. Now, I wouldn’t say it’s an alternative to fruits and vegetables, but it’s a pretty healthy evening snack when you’re in the mood. To make your “naked” air-popped popcorn, put three or four tablespoons of plain kernels into a brown paper lunch bag and fold it over twice to seal it. Microwave it for about two minutes, or until the popping slows down to one or two pops every few seconds. Then simply season it with whatever dried herbs or spices you like! Cottage cheese and Greek yogurt are also great options to keep your metabolism revved up while you sleep. Also, because of the slow-absorbing casein protein, these items can keep you satiated, so you don’t wake up starving and in a testy mood. When you make nutritious choices or come up with an eating plan, you can snack guilt-free in the evenings. Evening eating only becomes a problem when you’re mindlessly eating high-calorie, nutrient-deficient food. So, avoid things like chips, cookies, cake, and candies that can add thousands of calories in a very short time. Also, I find that getting out for a walk is a good way to stave off the evening hunger pangs, which are often a result of boredom. But when I want to watch a little television, I reach for a healthy, filling snack like, yogurt, cottage cheese, or air-popped popcorn—guilt free! Bauer, J., “Popcorn as healthy as veggies? Depends how you pop it,” Today, May 17, 2016; http://www.today.com/health/popcorn-healthy-veggies-depends-how-you-pop-it-t73016, last accessed July 17, 2017.